I remember the day I got Baking from my Home to Yours in the mail. I was so excited to finally flip through its pages and look at all the drool-worthy photos and read the delightful descriptions Dorie writes of every recipe. They were all quite tempting but one caught my eye and it has been known around these parts as the "I-have-to-make-this-tart-now" tart. Since I was just starting Tuesdays with Dorie at the time, I didn't want to try any one recipe just to have it be chosen by someone soon after. I really wanted to make the recipes as they were chosen. So I waited. Why didn't I choose that recipe when my turn came up? 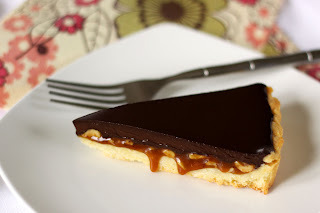 Perhaps because of the tart crust (I've always been a wee bit scared of them), or perhaps I was just as intrigued by the Chocolate Armagnac Cake as I was tempted by the Chocolate-Crunched Caramel Tart. In any case, here we are now and I finally had THE perfect excuse to make this tart! You guys all know how much I loooooove caramel, right? And chocolate, well that goes without saying. But peanuts, eh, they're not my thing. Since the recipe calls for honey roasted peanuts I always thought I might use pecans, almonds or cashews in the tart, but then on one trip to the grocery store, I came across a bag of honey roasted cashews. Honey Roasted Cashews! I couldn't believe my luck! This was going to be one great tart. I had really, really high expectations of this tart and it lived up to them and then some! 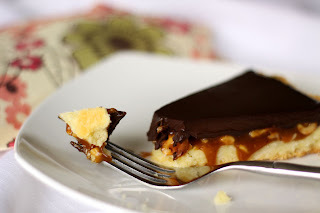 The silky ganache, the perfectly sweet and salty caramel, the crunchy contrast of the honey roasted cashews and the crispy cookie-like crust, all come together into one perfect dessert! It couldn't even be wrecked by the fact that I forgot to buy some unsalted butter last weekend and had only half of what was needed for the ganache. Even if it really was worth the wait, I would recommend you not to wait as long as I did to make this tart. If you don't have THE book (and you should!) visit Carla over at Chocolate Moosey and get thee that recipe right now! You will not regret it! And be sure to pay a visit to the rest of the Tuesdays with Dorie bakers for a massive dose of baking inspiration! I drooled over the pages on this one too. Im so glad we got to make it this week. Your tart looks wonderful...so glad you liked it! oh so good, and cashews are for sure my favorite nut!! Your tart is gorgeous! The caramel looks perfect! It's beautiful - love how the caramel drips down and is so decadent-looking. I've been wanting to make this as well and so glad it came up this week. Cashews.... that's a great combo with chocolate! Nicely done! I love your caramel dripping down the side of the crust. That just looks so good. You really did a fantastic job on this one. I was sure I would mess it up so I skipped out this week! Oh my! You have a real talent for cooking! The pictures are so enticing! Looks delicious. I used honey roasted cashews too! Your tart looks fab! Great job. des noix de cajou au miel ? pourquoi je ne connais pas ? ce sont mes noix préférées ! on peut lui donner tous les adjectifs à cette tarte, tellement c'est bon ! Your tart with honey roasted cashews sounds even better than mine with honey roasted peanuts tasted! :) Love your pictures! i had a little can of honey roasted cashews in my desk at work but i ate them all before i made the tart! boo on that. yours looks great! How nice, Lynne- you've found your "dessert soulmate" - or at least one of them ;) I love how gooey they middle layer becomes! Oh my! I want to reach my finger into the screen and swipe some of that caramel dripping down! Scratch that...I want to swipe the whole slice! I've made this tart with honey cashews too and it was super - didn't look as lovelyy as your does though! Gosh does that ever look good! That gooey caramel made me want to run for a spoon! There is something magical about the combination of these ingredients. I loved this tart. Your dripping caramel taunts me. Your photo looks amazing. And cashews? YUM! It looks fabulous! Love your photos. Isn't it wonderful when a recipe you've had your eye on meets and exceeds your expectations? You've inspired me to try this again - I'll master caramel eventually! What a treat to be able to make that gorgeous tart. It's called to me since I got my copy of Baking, but I haven't found the right excuse for making it. Yet. your tart look so incredibly great! !